I’ve just spent the past 10 days making sourdough bread. Well… Most of the time was sitting around and waiting for the starter to start – and then throwing out one batch that didn’t start – but methinks the end result was worth it. Really worth it! 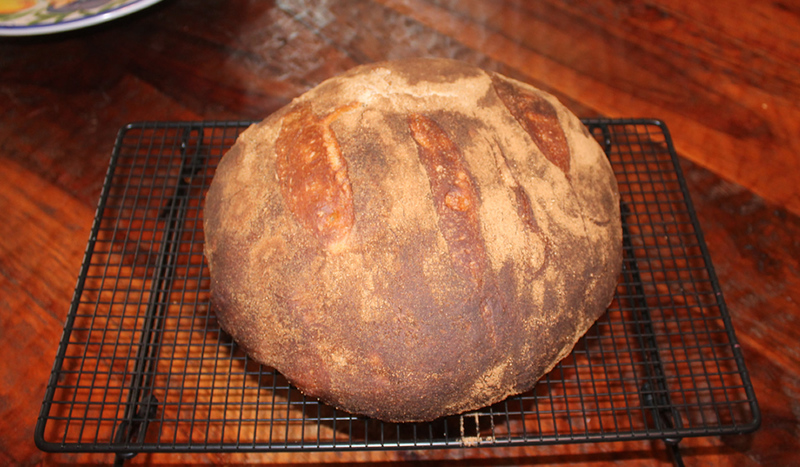 Today was the long day – I started at 7:00am and pulled the bread out of the oven at 4:00pm. It’s a rather involved process. Easy to do – but involved. 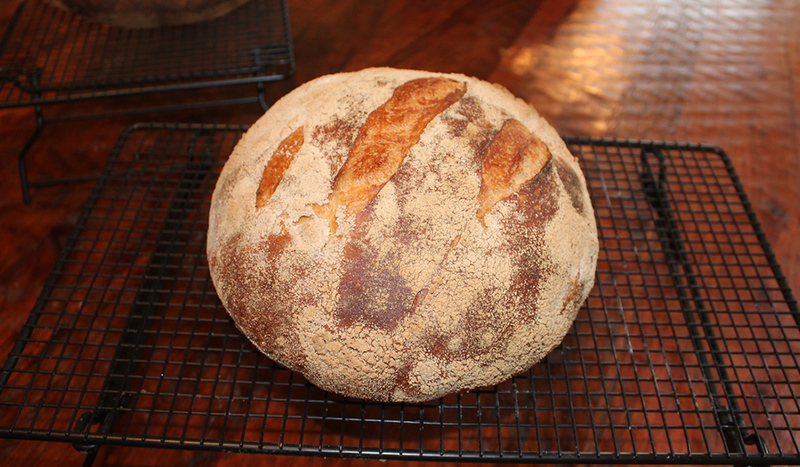 I made the Tartine Sourdough that I have made before – but never followed their baking instructions. I’ve always taken shortcuts and made long loaves. Nor have I spent the time doing the numerous folds, et al. It really is an all-day process. I’ve baked enough to be able to coax an acceptable loaf of bread out of just about anything – and also long enough to know that you can get stellar results when you take your time and do it right. Every now and then, I need a reminder – and I got it today! I’ll be doing it – mostly – their way, from now on! The bread is simply awesome. A really crusty crust and a really light, chewy, and flavorful interior. I was a good boy, I only ate two slices – I could have eaten the loaf! This really is the bread of my youth – when Larraburu reigned supreme in San Francisco. 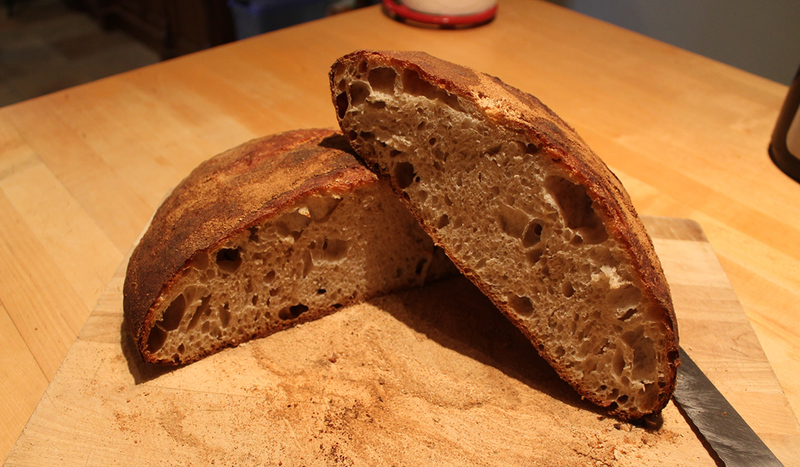 That dark crusty, chewy crust and the interior pocketed with holes. It was perfect. The difference is back then, the bread was made with all white flour – and this is 10% whole wheat. It makes a difference. Since the recipe makes two loaves – and we have double ovens – I made one in the dutch oven and one on the baking stones. You’ll notice that the dutch oven loaf has a bit of a finer crumb and less holes. The free-form round is definitely a bit more rustic. I think in the grand scheme of things, I actually prefer the freeform loaf with the larger holes. Flavor-wise, they were pretty indistinguishable. 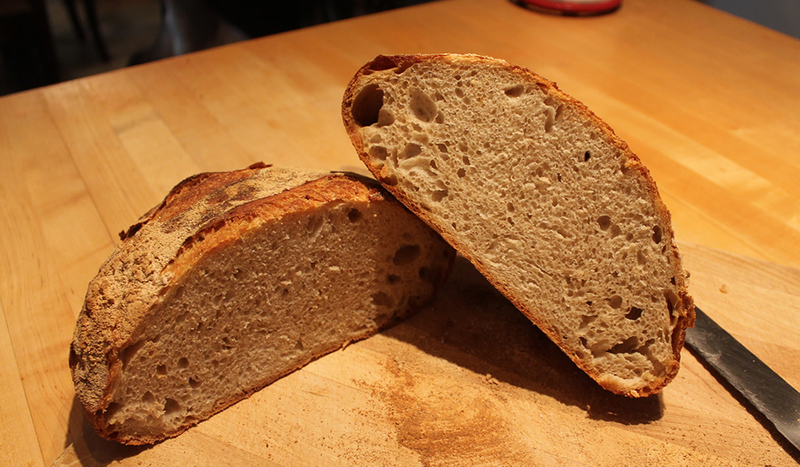 I just like the larger holes – it’s the type of bread I grew up on. One and a half loaves went into the freezer – I’m not going to start eating bread at the same rate that I used to – but I do see some paninis or other sandwiches in our future. And there’s more leaven in the ‘fridge for those rapidly-approaching cold, winter days… This would be so good with a pot of vegetable soup!